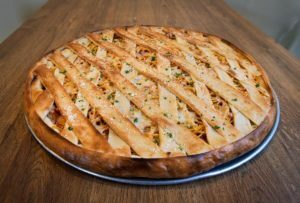 For years, F&M students have debated which of the two local pizza restaurants, Rosa Rosa Pizzeria and Steel Peel Pizza, is superior. As a first-year with a fresh perspective, having not tried either one, I decided I needed to test them both and form my own opinion. I first went to Rosa Rosa, which recently reopened in October after being closed for two years due to a fire in November of 2016. It’s located on Harrisburg Avenue, past Turkey Hill, just a short walk from campus. Walking in, I immediately noticed the clean, homey feel of the restaurant. There were pictures on the walls of places in Italy. There were also multiple large televisions, and the restaurant was full for an important sports game. There was a large amount of seating, so it would be a great place to host a post-game dinner or a large group hangout. Through the window, I could see many large, appetizing pies of all kinds. I chose a slice of the white tomato pizza and a slice of the veggie pizza. They were reasonably priced, and the employees were helpful and friendly. When they delivered the slices to my table on white paper plates, the pizza was warm and dripping in oil – in the best way. I bit into the white tomato slice, topped with tomatoes, basil, garlic, and cheese, and it was doughy, cheesy, and the perfect temperature. I like my pizza crust on the softer side and Rosa Rosa definitely delivered. The veggie slice was just as good, with perfectly-cooked veggies, although the crust was a bit more crispy. Still, both slices tasted fresh and were cooked to perfection. If you go, try the house specialty, the spaghetti pizza. My next stop was Steel Peel, who had to beat my great first impression of Rosa Rosa. The interior was a little smaller, with an industrial atmosphere created by white tile and steel accents, the opposite of the inviting wood accents of Rosa Rosa. The pizza didn’t look quite as appealing on display, but I kept an open mind, knowing taste was the deciding factor. I was unimpressed with cashier, who didn’t have much knowledge about the pizzas on display, which was frustrating for a new customer like me. The price of a slice was a little less expensive than at Rosa Rosa. I decided on a unique slice that seemed to be their specialty – ricotta and honey. With the first bite, I could tell that the quality of the pizza was notably inferior to Rosa Rosa’s. I loved the unlikely, yet ingenious combination of ricotta and honey – it made for a interesting sweet and salty taste that I hadn’t experienced before, but the pizza itself did not taste as fresh and the crust was much crunchier, possibly overcooked.